Hello guys, there's been a few minor adjustments to the medical system. Our MREs were contaminated with some Warfarin by a very unusual mix up with logistics. As a result our blood is now thinner. Thus our wounds will now bleed at a higher rate. Thanks to the Nimble Fingers Initiative, we've been able to decrease the time it takes to apply tourniquets. The NFI program has also provided the medically trained the capability of self-injecting small IV bags (250ml). However, until the inquiry into the logistics con-fuddle has concluded, their supply will be limited at best and most likely non-existent. Refinements to Epinephrine have increased the duration of the effects almost two-fold, however it is now a lot more susceptible to overdose, with the maximum dosage now similar to Morphine. Further scientific study has concluded that Morphine is more harmful than originally thought when it comes to altering blood viscosity. Keep patients blood pressure under more scrutiny moving forward. In a similar vein, Epinephrine has been observed to also affect blood pressure in a manner that most would conclude. FIXED: Units in CardiacArrest should no longer break the CPR/Defib script. There should now be fewer (hopefully none) units stuck with zero heart rate, and CPR that's reported as being not needed. I'm currently investigating the possibility of adding a CardiacArrest animation to tell the difference, as well as a battlefield solution to make it independent. FIXED: Casualties who received CPR and then were abandoned will last now no longer than 3 minutes, regardless of how many times they were CPR'd. Previously it was theoretically possible to infinitely stack additional time of their unconscious state. That could have resulted in a section CPRing someone, being wiped, and then waiting say an hour for that guy to eventually die. ADJUSTED: Casualties current blood volume now has a greater impact on how much their life is extended via CPR/Defib. The more blood they have, the longer they'll hang on. There shouldn't be a significant impact on our mortality rates, but those that do perish during CPR should be more understandable than the more random-weighted based system previously used. ADJUSTED: Defibs now cause more pain than before. ADDED: The amount of people over one person assisting on a casualty will now result in diminishing returns on the effectiveness of CPR. More the merrier still applies and should be done when possible, however their contributions won't impact nearly as much as it did previously. Previously if two people or more were conducting CPR on someone, that casualty had a near-impossible chance of dying. These changes will help balance that, whilst still rewarding teamwork. ADDED: Units that are instantly killed via explosion will have their items and weapons destroyed, in order to maintain compatibility game-play wise with blood-lust. It also makes sense. The changes will go live with the next twc_framework mod update. ADDED: Resuscitation chance is now negatively affected by peripheral resistance (blood viscosity). This means that medications such as morphine, atropine and adenosine will negatively impact the chance of someone waking up via CPR. ADJUSTED: The amount of "stackable" time, previously mentioned as being 3 minutes is now dynamic based upon the patients blood level. Transporting people who took a beating will require a lot more CPR during moving than those that were hit the bare minimum to go unconscious. ADJUSTED: Increased the blood level modifier on the amount of time given to someone's life via CPR/Defib to help balance with the above change. ADDED: Unconscious Double-Check Loop. After a player has gone unconscious and thirty seconds have elapsed, a loop every second will check if they should actually be unconscious. If not, it'll wake them up and stop double checking. If the bug continues to persist (most reportedly affecting Lukey, either in his diagnosis or own state), then you should be unconscious according to ACE_Medical. Please report if this issue occurs again. ADJUSTED: Elastic bandage apply time has been decreased to make it a reasonable option compared to alternatives, until their effectiveness on wounds are rebalanced. ADDED/POSSIBLE FIX: Force ACE Medical data re-sync on successful CPR/Defib. However, due to core ACE medical functionality the effects of this may not be immediate, thus still presenting the possibility of being out of sync for a second or two. I do believe this shall significantly reduce the occasions, however. Notable symptoms of this were heart beat read outs for some, whilst not for others. REFINED: Forcing ACE medical re-sync after successful CPR/Defib worked well last night, with only one occasion of de sync I noticed - certainly didn't cause any issues like it did previously. I've now added an immediate call following that, so hopefully it should be non-existent from henceforth. ADDED: If a unit is unconscious with their head under water, they won't fare so well with a significantly decreased time till death. ADDED: Added a debug option to the diagnose menu on the medical menu interface. If you have a patient that you suspect should be fine, please press this button and then get in contact with me. This should help me ascertain where a bug lays a lot easier, or if there even is one to begin with. I may add on this in the future to also log their state on their end as well, to check sync issues. ADDED: Redundancy Check for the Uncon State. Should validate if you should be nearing death once per second whilst in that state. This is a rough patch for an issue recently experienced on public. As of the moment, I am unsure of what the underlying cause of it is. FIXED: Multiplication error in death timer. Individuals should find themselves staring from above in a more timely and predictable manner. ADJUSTED: Death via Blood Loss is now much easier to reach. Once below a certain percentage, you will meet your maker as opposed to a straight value of 0 blood as before. ADJUSTED: I moved some code around to be executed only when necessary as well as reduced some computational workloads, in the ever lasting chase of optimisation. ADJUSTED: BloodLust compatibility was overhauled to work in conjunction with the twc bloodlust fork, @twc_bloodlust. Testing is required, and I will be monitoring this through out this week. Please report issues to me! ADDED: Forced vital sync on units who are unconscious. Now when a unit is down, it will force an update over the network of their heart rate and blood pressure every second. Blood levels are always sync'd. This should help combat some noticeable ACE Advanced Medical de-sync. Will monitor closely for performance degradation, particularly in a mass casualty situation. ADDED: Some minor optimisations to the code, to whittle down execution till only when necessary. ADJUSTED: Added a couple more values to the debug log to keep track of. If you do notice an error, please click the button and share your RPT with me. 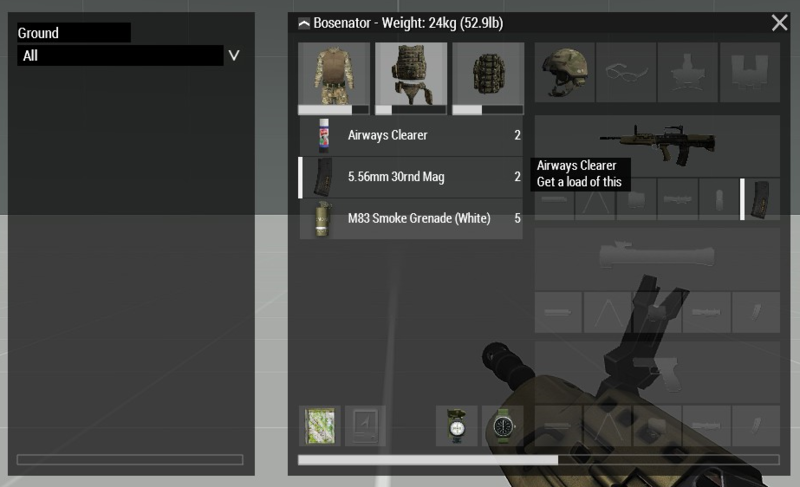 FIXED: Weapons/gear of those who were vaporized should now be removed. Previously I was trying to pry the weapons from the still living, and BI denied me this opportunity. ADJUSTED: Blood loss related death will also now take into account blood pressure, in the off chance they have reasonable pressure but low volume of blood (some medications affect viscosity). ADDED: Further code clean up. ADDED: AI medical groundwork. I now have a very rudimentary system in place for handling the AI once they go unconscious. They should either die a bit faster, or have a greater chance of getting back up. Now that I know this can work, I will be expanding on this element for the goal of making an enjoyable/realistic solution - including handling damage when they are unconscious. ADJUSTED: Tweaked the CPR timings to be a bit more reliant on blood level than before, to help make those that are heavily injured meet their maker quicker. ADDED: Airways Management. Fed up on waiting for ACE Medical to implement this, I've decided to go ahead and implement our own. Over the course of a play session on either public or an operation, you may encounter a blocked nose. This could be for a myriad of reasons, of which I'll allow you to discover. The result of this is that you'll run out of stamina a lot faster, and the recovery with it will be a lot slower. This is fed back to you, via a slightly green gooey texture around the edge of your screen. Be-careful though. If you use it numerous times in quick succession, you will become unconscious. ADDED: Added support for public missions to have a bolstered CPR chance. This only affects the CPR chance, as to not cause confusion for other elements. I want to keep as close as possible an experience between the two, but with the option of re-spawning, I see the merit in not having people unconscious for greater than 5 minutes. ADJUSTED: Modified AI uncon handling in regards to how they handle getting back up. Their clothes shall now remain bloodied, too. ADJUSTED: Increased baseline defibrillator chance of resuscitation, but have also increased the negative modifier of blood loss. Therefore, blood volume will have a more substantial feel to the success chance. This is to help situations where the casualty is in a generally good state, but is taking excessive pain from defibs due to their lack of luck. REMOVED: "Unnecessary CPR" notification, it will now just state you did a round of CPR as normal. It was never intended to be in there permanently, and was used for debugging a while ago, but I forgot to remove it until Hobbs jogged my memory the other day. ADJUSTED: Decreased blood volume requirement for defibrillator by 10%. ADDED: Loose Bandages, Suture Kit and Tourniquet Indicators. Further information on this can be found here, with more details forthcoming once adjustments have settled down and I'm content with the state. ADJUSTED: Lowered the overdose threshold for Morphine. It's now easier to die from abuse. "Combat Mix" is a dangerous game. ADJUSTED: Increased the duration Epinephrine is in the body, from the default of two minutes to fifteen. This means it's easier to overdose, as there's a longer period in which the threshold can be met, but also increases its usefulness in CPR like situations. REMOVED: "Lost a lot of Blood" indicator has been removed in preparation for a potential future change. Currently trialling just this sole change, seeing if it'll aid a more engaging medical process and better saline discipline. REMOVED: Patient Display Card. This display is feature incomplete with many of the previous changes, and serves now only to confuse. It will come back in the future once it's been reworked, but is low priority given the prevalence of use and importance of the medical menu over it. FIXED: An issue where players with very very low blood pressure were "alive", aka in the unconscious animation. They should now appropriately die when their blood pressure is considerably low. Below 20 on systolic & diastolic blood pressure, combined. This didn't happen often, as usually players hit their too low blood volume level prior - but there was a combination of having some (albeit low) blood and medication, that could cause no pressure but still being alive. This thread is now going to be archived. All future medical change notices will be made in the Modset Chanelog as originally outlined. Please keep your eyes peeled for that thread, as there is a rather significant change upcoming soon. Thanks to all the bug reporters, and play testers.